Models like Cupide which are used for road features such as Decodance are nearly always repeated a number of times along a section of the Illuminations. To create multiple copies a mould is made of the model. From this, as many fibreglass casts can be taken as required. To achieve this, the polystyrene model is coated with plaster and then sanded down again to create a smooth finish. This is done so that the resin used in making the mould doesn't eat into the polystyrene. 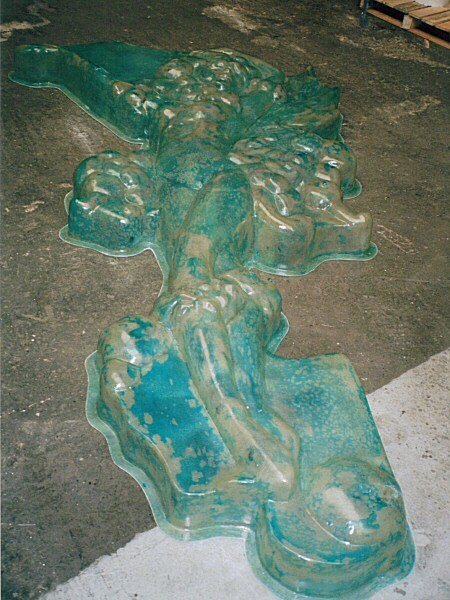 To create the mould, fibreglass is laid over the plaster and coated with resin. Once this is complete, the original polystyrene model and plaster are destroyed. 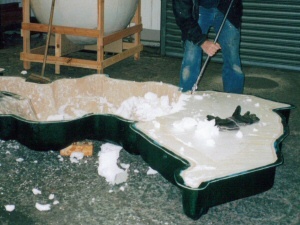 They are dug out of the mould to leave an empty shell - a fibreglass mould that can be used to create many casts. To create a cast, the mould is first lined with several layers of wax and a mould release agent. It is then lined with fibreglass which is coated with resin. This is what will become the actual fibreglass cast. The wax and release agent ensure that the fibreglass cast does not stick to the mould and can be more easily removed. After casting, the blue mould release agent is easily washed off with a hose. The finished cast is smooth to touch, with a plastic-like finish to it to which paint doesn't stick. Before painting can begin therefore, it is sanded to provide a rougher surface for the paint to adhere to.